There is a big birthday coming up in the next week, my granddaughter will be 1 year old on the 26th, so this card will be given to her. Her mom has always loved otters, I remember vising the National Zoo in DC and she disappeared and that is where she went, granted she was right around the corner from where we were standing but dang, she was a week away from turning 7 and this mama was freaked out. SO, when this stamp set came out I had to have it, and finally pulled it out of my stash to use it for this challenge. My first step in making this card was to cut the circle with my big shot and a circle die from Spellbinders. I then used a stencil from Die Cuts and More and Bo Bunny glitter paste to make the water impression feature. Using Recollections 110 lb cardstock I stamped out my 3 otters using StazOn ink in Hydrangea Blue, Saddle Brown and Stone Grey. I stamped the 3 packages using Memento Angel Pink. Once I had the images cut out I colored the otters using Rich Cocoa, Desert Sand and London Fog, and added a touch of Angel Pink to the ears. The card base is Recollections 110 lb, the top panel is from a Momenta Textured Cardstock pack and attached with Tear It ! Tape, the sentiment was stamped with the Hydrangea Blue. The water feather element is attached with foam tape, and tear it tape was used to attach the cute little otters. The final touch was to use On Point Glue to attach the packages. 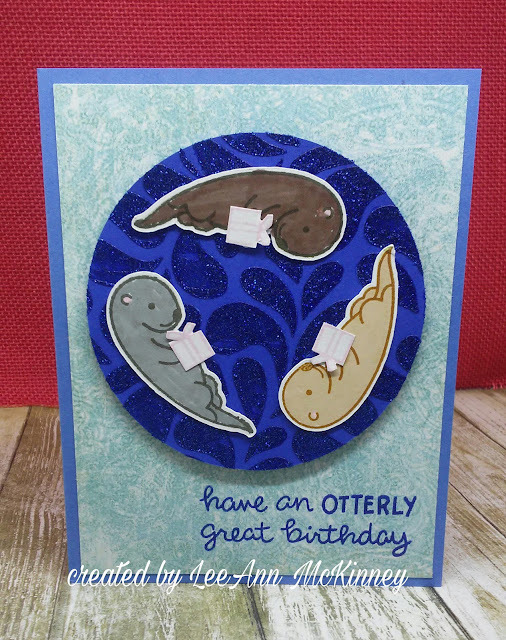 Very cute card, adorable otters! Thank you for sharing your card at A Blog Named Hero. Love your card LeeAnn! Those otters are adorable and love how they are holding the gifts. Thanks for playing along with A Blog Named Hero. So sweet! I love that the otters are carrying the gifts as they swim. Your granddaughter will love it! Thanks so much for joining us over at A Blog Named Hero!